​​FOR MANY YEARS, since the introduction of the breed into the UK (and other countries), a few health problems have been noted. As with all canine health issues, no one concern is restricted to the BGV. some of the disorders are known to be congenital, whether inherited or caused by the environment. A congenital condition therefore may nor may not be heriditary. Here are a few of the known conditions. All are monitored within the breed. Although none is severe enough to currently cause undue concern, the Health Committee invites anyone whose BGV has a health problem to contact them, as submission of cheek swabs to the Animal Health Trust now may prove invaluable in the future should any health issue warrant further research and investigation. Since early 2012 the BGV Club has been aware of instances of craniomandibular osteopathy in BGVs. Known cases were mainly in GBGV puppies, though a couple had also been reported in PBGVs. The BGVC Health Sub-Committee has been monitoring the condition in the breed and the Third World Congress at Warwickshire in November 2012 gave the opportunity to make representatives worldwide aware of the problem. Sometimes known as "Lion Jaw", craniomandibular osteopathy (CMO) is a bone disease of growing dogs. There is excessive, abnormal bone growth of the skull and lower jaw. Irregular enlargement of the affected bones results in extra bone growing on the surface of the lower jaw, making it wider and thicker. It may also affect the jaw joint. In severe cases, the excess bone may prevent the jaw joint from opening and closing normally. WHAT CAUSES CM0 AND WHICH BREEDS DOES IT AFFECT? The cause of CMO is unknown. It is neither cancerous nor caused by inflammation. It is an inherited condition known mainly in several terrier breeds, though has been reported in a few other breeds. WHAT ARE THE SIGNS OF CMO? The signs of disease usually occur between 4-8 months of age. There is swelling of the jaws, difficulty eating and pain on opening the mouth. Sometimes opening the mouth proves difficult or practically impossible. Dogs may drool and be depressed. Often the body temperature will fluctuate over time, with fever occurring in phases every 10-14 days. In severely affected dogs, the muscles used for chewing may atrophy and there may be swollen glands. 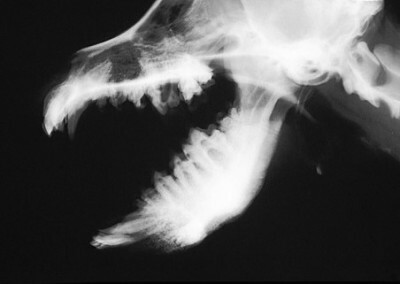 X-rays of affected dogs demonstrate irregular thickenings of the various facial bones. It may be necessary to sedate or lightly anaesthetise the dog to obtain good x-rays, since it is a painful condition and the dog may not lie quietly. Although the mode of inheritance is known to be autosomal recessive in West Highland White Terriers, in other breeds including the BGV the mode of inheritance has yet to be determined. WHAT DOES CMO MEAN TO YOUR BGV AND YOU? 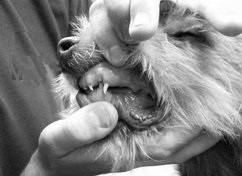 Your puppy may have a swollen and painful lower law, or have trouble opening the mouth or eating, or drool excessively. You may not notice all of these problems continuously; the signs may seem to flare up at times then get better. This disease is "self-limiting." Abnormal bone growth will typically stop and begin to regress by one year of age. So, after your puppy is a year old, the condition will probably not get worse - and should get better. However if there has been severe bone growth, especially involving the jaw joint, the excess bone may not go away on its own. In some cases, particularly if the jaw joint is not working properly, your BGV may need surgery. Your puppy's condition is more serious and the prognosis is guarded if there is excessive bone growth on the base of the skull. Your vet will diagnose this disease based on physical examination, history and x-rays. There is no treatment to stop the disease from getting worse; it will usually get better as your puppy grows up. Pain can be relieved with anti-inflammatory drugs. Your puppy may need surgery in certain severe cases. If you have a BGV affected by this health problem, contact Health Sub-Committee members Peter Marks or Vivien Phillips who will help you to send cheek swabs to the AHT. These need to go with pedigree and a report from your vet. There is no charge for this research. While POAG and cataracts remain the main problem in the breed, there is some minor evidence of Persistent Pupillary Membranes (PPMs) and Lens Luxation. Persistent Pupillary Membranes are strands of tissue in the eye. They are remnants of blood vessels which supplied nutrients to the developing lens of the eye before birth. Normally these strands are gone by 4 or 5 weeks of age. Generally they cause no problems. However if attached to the cornea or lens, the strands can cause opacities which may interfere with vision. Cataracts that may possibly occur with PPM usually don't worsen. Lens Luxation is the dislocation or complete displacement of the lens within the dog's eye. The lens is the clear structure in the eye, consisting of two rounded or convex surfaces, that focuses light rays to form an image onto the retina. Normally the lens is suspended between the iris (the coloured portion of the eye) and the vitreous (the clear gel in the back of the eye), and is held in place by small fibres or suspensory ligaments. Causes of lens luxation may be primary or secondary. Where the lens luxation is not associated with trauma (secondary) it is assumed to be "primary" and therefore an inherited disorder and treatment varies on the position of the lens, the presence of acute glaucoma and the potential for sight. The main aim is to reduce the pressure in the eye and subsequently monitor pressures, with medication to help. Hypothyroidism has been reported in a few BGVs. An inadequate or subnormal thyroid gland function results in immune destruction of the thyroid gland. Clinical signs include obesity, lethargy, mental sluggishness, hair loss, change in coat texture, infertility and hyperpigmentation of the skin. While hypothyroidism cannot realistically be prevented, it is not particularly difficult to diagnose and treat. There is no evidence at present that this is hereditary in BGVs but obviously, if the condition is diagnosed, it is prudent not to breed from that individual. If this occurs, the digestive enzymes will begin to break down fat and proteins in the other organs, as well as in the pancreas. In effect, the body begins to digest itself. Because of their proximity to the pancreas, the kidney and liver can also be affected when this progression takes place, and the abdomen will become inflamed, and possibly infected as well. If bleeding occurs in the pancreas, shock, and even death can follow. Inflammation of the pancreas (or pancreatitis) often progresses rapidly in dogs, but can be treated without any permanent damage to the organ. Always consult your vet who will begin a course of treatment but you can help your BGV by feeding bland, low fat, high carbohydrate, easily digestible food until the condition has cleared thoroughly. Steroid responsive meningitis, sometimes known as juvenile pain syndrome, aseptic meningitis or spinal meningitis, is a condition which has attracted considerable concern among Petit owners in a few countries. It has been known to crop up in the UK in Petits and occasionally in Grands but usually affects young dogs up to two years. Most cases respond to treatment with drugs that include analgesics, antibiotics and corticosteroids. A vet is likely to warn that relapses can occur but, beyond the age of about four years, these are unlikely. Although no genetic predisposition has been established, clearly it is unwise to breed from any affected individuals. Although numbers are quite small, the BGV Club now arranges for DNA samples of affected BGVs to go to the Animal Health Trust. If you have a BGV affected by this health problem, contact Health Sub-Committee members Peter Marks or Vivien Phillips who will help you to send cheek swabs to the AHT. These need to go with pedigree and a report from your vet. There is no charge for this research. Remember - if you have any concerns about your BGV's well-being which appear to be related to any of the known health problems in the breed, let us know.